Elihu Root (; February 15, 1845 – February 7, 1937) was an American lawyer and statesman who served as the Secretary of War (1899–1904) under two presidents, including President Theodore Roosevelt. He was the prototype of the 20th century revolving door, shuttled between high-level appointed government positions in Washington, D.C. and private-sector legal practice in New York City. He was elected by the state legislature as a US Senator from New York and served one term, 1909–1915. Root was awarded the Nobel Peace Prize in 1912. Root was a leading lawyer, whose clients included major corporations and such powerful players as Platt Amendment of 1901, which authorized American intervention in Cuba in the future if needed to maintain a stable government. He was a strong advocate of what became the Panama Canal, and he championed the Open Door to expand world trade with China. Root was the leading modernizer in the history of the War Department, transforming the National Guard into an effective reserve, and created the Army War College for the advanced study of military doctrine and most important set up a general staff. As Secretary of State under Theodore Roosevelt, Root modernized the consular service by minimizing patronage, promoted friendly relations with Latin America, and resolved frictions with Japan over the immigration of unskilled workers to the West Coast. He negotiated 24 bilateral treaties that committed the United States and other signatories to use arbitration to resolve disputes, which led to the creation of the Permanent Court of International Justice. In the United States Senate, Root was part of the conservative Republican support network for President William Howard Taft. He played a central role at the Republican National Convention in 1912 in getting Taft renominated. By 1916–17, he was a leading proponent of preparedness, with the expectation the United States would enter World War I. President Woodrow Wilson sent him to Russia in 1917 in an unsuccessful effort to establish an alliance with the new revolutionary government that had replaced the czar. Root supported Wilson's vision of the League of Nations, but with reservations along the lines proposed by Republican Senator Henry Cabot Lodge. Root was born in Clinton, New York, to Oren Root and Nancy Whitney Buttrick, both of English descent. His father was professor of mathematics at Hamilton College. After studying at local schools, including Williston Seminary, where he was a classmate of G. Stanley Hall, Elihu enrolled in college at Hamilton. He joined the Sigma Phi Society and was elected to the Phi Beta Kappa Society After graduation, Root was an instructor of physical education for two years at Williston Seminary, and taught for one year at the Rome (N.Y.) Free Academy. Despite his parents' encouragement to become a Presbyterian minister, Root went to New York City to attend New York University School of Law, from which he graduated in 1867. His brother Oren then became a minister and followed in their father's footsteps as Mathematics professor at Hamilton. After admission to the New York bar, Root went into private practice as a lawyer. While mainly focusing on corporate law, Root was a junior defense counsel for William "Boss" Tweed during his corruption trial. Among Root's prominent and wealthy private clients were Jay Gould, Chester A. Arthur, Charles Anderson Dana, William C. Whitney, Thomas Fortune Ryan, and E. H. Harriman. After getting established, in 1878 at the age of 33, Root married Clara Frances Wales (died in 1928). She was the daughter of Salem Wales, the managing editor of Scientific American, and his wife. They had three children: Edith (who married Ulysses S. Grant III), Elihu, Jr. (who became a lawyer), and Edward Wales Root (who became Professor of Art at Hamilton College). Root was a member of the Union League Club of New York and twice served as its president, 1898–99, and again from 1915–16. He also served as president of the New York City Bar Association from 1904–1905. Root received his first political appointment from President Chester A. Arthur, when he was named as the U.S. Attorney for the Southern District of New York. Under presidents Spanish–American War. He worked out the procedures for turning Cuba over to the Cubans, ensured a charter of government for the Philippines, and eliminated tariffs on goods imported to the United States from Puerto Rico. When the Anti-Imperialist League attacked American policies in the Philippines, Root defended the policies and counterattacked the critics, saying they prolonged the insurgency. Root left the cabinet in 1904 and returned to private practice as a lawyer. 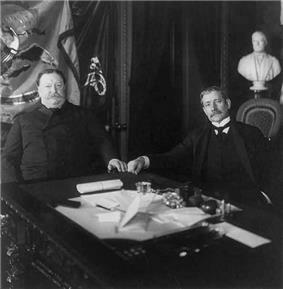 Root with William Howard Taft in 1904. In 1905, President Roosevelt named Root as the United States Secretary of State after the death of John Hay. As secretary, Root placed the consular service under the civil service. He maintained the Open Door Policy in the Far East. On a tour to Latin America in 1906, Root persuaded those governments to participate in the Hague Peace Conference. He worked with Japan to limit emigration to the United States and on dealings with China. He established the Root–Takahira Agreement, which limited Japanese and American naval fortifications in the Pacific. He worked with Great Britain in arbitration of issues between the United States and Canada on the Alaska boundary dispute, and competition in the North Atlantic fisheries. He supported arbitration in resolving international disputes. 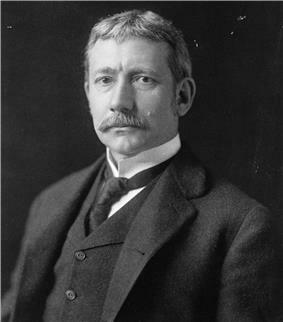 In January 1909, Root was elected by the legislature as a U.S. Senator from New York, serving from March 4, 1909 to March 3, 1915. He was a member of the Senate Committee on the Judiciary. He chose not to seek re-election in 1914. During and after his Senate service, Root served as President of the Carnegie Endowment for International Peace, from 1910 to 1925. The reason why the citizens of New York will pay so large a part of the tax is New York City is the chief financial and commercial centre of a great country with vast resources and industrial activity. For many years Americans engaged in developing the wealth of all parts of the country have been going to New York to secure capital and market their securities and to buy their supplies. Thousands of men who have amassed fortunes in all sorts of enterprises in other states have gone to New York to live because they like the life of the city or because their distant enterprises require representation at the financial centre. The incomes of New York are in a great measure derived from the country at large. A continual stream of wealth sets toward the great city from the mines and manufactories and railroads outside of New York. In 1912, as a result of his work to bring nations together through arbitration and cooperation, Root received the Nobel Peace Prize. At the outbreak of World War I, Root opposed President Woodrow Wilson's policy of neutrality. Root promoted the Preparedness Movement to get the United States ready for actual participation in the war. He was a leading advocate of American entry into the war on the side of the British and French, because he feared the militarism of Germany would be bad for the world and bad for the United States. He supported Wilson once the United States entered the war. In June 1916, he scotched talk that he might contend for the Republican presidential nomination, stating that he was too old to bear the burden of the Presidency. At the Republican National Convention, Root reached his peak strength of 103 votes on the first ballot. The Republican presidential nomination went to Charles Evans Hughes, who lost the election to the Democrat Woodrow Wilson. In June 1917, at age 72, Root went to Russia, which had just overthrown the czar. He headed a mission sent by President Wilson, the Root Commission, to arrange American co-operation with the new revolutionary government. Root remained in Petrograd for close to a month, and was not much impressed by what he saw. American financial aid to the new regime was possible only if the Russians would fight on the Allied side. The Russians, he said, "are sincerely, kindly, good people but confused and dazed." He summed up the Provisional Government very trenchantly: "No fight, no loans." Root was the founding chairman of the Council on Foreign Relations, established in 1918 in New York. In the Senate fight in 1919 over American membership in the League of Nations, Root supported Lodge's proposal of membership with certain reservations that allowed the United States government to decide whether or not it would go to war. The US never joined, but Root supported the League of Nations and served on the commission of jurists, which created the Permanent Court of International Justice. In 1922, when Root was 77, President Warren G. Harding appointed him as a delegate of an American team headed by Secretary of State Charles Evans Hughes. They participated in the Washington Naval Conference (International Conference on the Limitation of Armaments). Root's former home in Washington, D.C.
Root also worked with Andrew Carnegie in programs for international peace and the advancement of science, becoming the first president of the Carnegie Endowment for International Peace. Root was also among the founders of the American Law Institute in 1923, and also helped create the Hague Academy of International Law in the Netherlands. Root served as vice president of the American Peace Society, which publishes World Affairs, the oldest U.S. journal on international relations. In addition to receiving the Nobel Prize, Root was awarded the Grand Cross of the Sons of the American Revolution in 1895, based on his descent from Elihu Root (1772–1843), and was the second cousin twice removed of publisher Henry Luce. Before his death, Root was the last surviving member of the McKinley Cabinet. Root died in 1937 in New York City, with his family by his side. 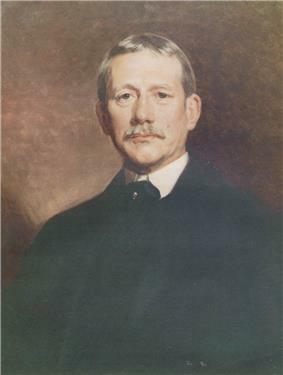 His son, Elihu Root, Jr., like his father graduated from Hamilton College and became an attorney (as well as married the daughter of Hamilton's president, M. Woolsey Stryker). His daughter Edith married Ulysses S. Grant III. A simple service was held in Clinton, led by Episcopal bishop E.H. Coley of the Episcopal Diocese of Central New York. Root is buried along with his wife Clara (who died in 1928) at the Hamilton College Cemetery. Root's home in Clinton, which he purchased in 1893, became known as the Elihu Root House, and was declared a National Historic Landmark in 1972. The United States Army Reserve Base in New York Mills, New York bears his name. The Elihu Root Gold Medal is awarded to the six highest scoring civilian competitors in the National Trophy Rifle Team Match and are subsequently named as team members. The captain and coach of the highest-scoring civilian team are named as the coach and captain of the team. 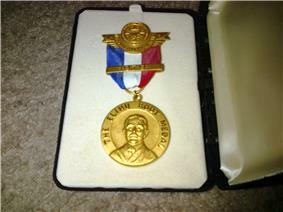 All eight members receive Elihu Root gold medals. ^ Cross, Graham (2012). The Diplomatic Education of Franklin D. Roosevelt, 1882-1933. New York, NY: Palgrave Macmillan. p. 71. ^ "Tells How Allies Failed in Russia: Col. Robins Says Boastful American Propaganda Led Russian Army to Quit; Root Mission Knifed Here". New York Times. March 7, 1919. p. 18. ^ James R. Arnold (2011). The Moro War: How America Battled a Muslim Insurgency in the Philippine Jungle, 1902–1913. Bloomsbury Publishing. pp. 171–72. ^ March 1, 1910New York Times,"Root For Adoption of Tax Amendment,"
^ Stefan Lorant, The Glorious Burden (New York: Harper & Row, 1968), page 540. ^ David Mayers (1997). The Ambassadors and America's Soviet Policy. Oxford University Press. p. 77. The National Cyclopædia of American Biography. (1939) Vol. XXVI. New York: James T. White & Co. pp. 1–5. Needham, Henry Beach (November 1905). "Mr. Root and the State Department". Ten Eyck, Andrew (October 19, 1921). "Elihu Root - A Study Of The Man And His Ways". Ferraioli, GianPaolo, L'Italia e l'ascesa degli Stati Uniti al rango di potenza mondiale (1896-1909). Diplomazia, dibattito pubblico, emigrazione durante le amministrazioni di William McKinley e Theodore Roosevelt, Napoli, Edizioni Scientifiche Italiane, 2013.